Preparing for a career in the education field was made easier for Lakyn Frey thanks to a cohort offered in Jane, Mo. Frey, who graduated from Missouri Southern in mid-May, was selected as one of the program’s Outstanding Graduate award recipients. She says the smaller class sizes and the ability to maintain a job while attending school were major factors in her decision. The convenience and location of the facility in Jane offers an attractive option for students and is one of the reasons the program is growing, according to Matthew Beaver, Missouri Southern’s coordinator teacher education. 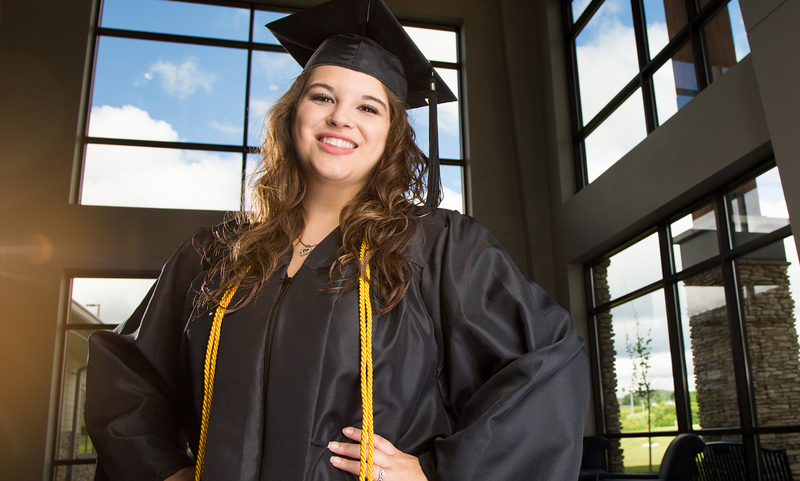 Frey, a 2012 graduate of Rogers Heritage High School, attended the University of Central Arkansas-Conway and then spent two years at Northwest Arkansas Community College (NWACC). In her junior year, she transferred to Missouri Southern in Joplin. Not long after that, the campus in Jane opened. Beaver says Missouri Southern has worked closely with Northwest Arkansas Community College (NWACC) to ensure a smooth transition to Missouri Southern’s program. The program is steadily growing. This year, four students completed their education in Jane: Frey of Bella Vista, Elizabeth Reyes of Rogers, Ark., and Katelin Forbes and Breanna Watkins of Noel, Mo. The next cohort should have 10 graduates. About 15 students are finishing up requirements to attend the program in Jane this fall. Beaver says the Jane cohort has a lot going for it. Frey recently signed a contract with the Neosho School District to teach fourth grade at Goodman Elementary School. She believes Missouri Southern has prepared her for success in her field.